Last year, I asked you, dear readers, for ideas for children’s and YA books to give my nieces and nephews for Christmas. You came through with flying colors, as I knew you would! In fact, your recommendations were so good that I ended up adding some of them to my own TBR list. This was one of those books. 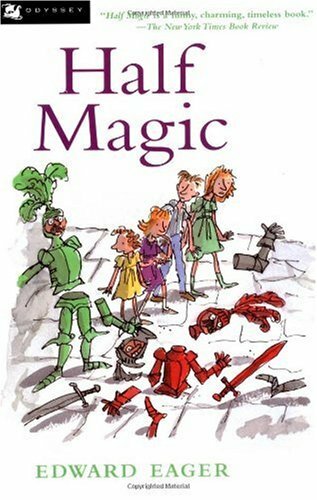 Published in 1954, Half Magic by Edward Eager is a good old-fashioned adventure story. It involves four children who are just trying to get through a dreary summer, staying out of the way of the housekeeper, Miss Bick, and longing for a summer in the country or on the lake. Alas, their mother must work to support them because their father died years ago, so they are left having to content themselves with library books. The summer takes a turn when they find a magic talisman that grants wishes, but only by halves. Once the children are onto the trick of it, they are able to use it to have great adventures. Of course, even the most careful children are likely to slip up from time to time, so mistakes happen, and one of these goofs leads them into an even bigger adventure with more significant consequences than they might have imagined. As much fun as the story is, it was nearly done in by the audio production by Listening Library. Instead of a standard audiobook with a single narrator (or perhaps multiple chapters for different narrators), the Half Magic audiobook is more like a radio play, with different voice actors performing the dialogue of the characters. However, because the book is not written as a play, the transitions from narrator to character are awkward. Plus, a couple of the children have a tendency to be shouty, which I found both jarring and annoying. And the main narrator uses a sort of intense, excited voice that made me feel on edge, rather than charmed. I got used to it eventually, but I almost quit the book early on. It may be that the overly excited narration and the multiple voices would be appealing to children, the primary audience for the book, but it didn’t work for me. I also have some complaints about the story itself. The adventures were enjoyable enough, and I liked how they started to pale in comparison to some of the real-life drama. There are a couple of moments of real emotional honesty there, particularly those involving the oldest child, Jane. However, the real-life drama is strongly influenced by the attitudes of the time in which the book is set, and the definition of happiness and of family is limited by that point of view. For that reason, certain situations develop much more quickly than they probably ever would—or ever should—in real life. That may be a case of my taking a silly story too seriously, but it still bugged me a bit and took me out of the story. So not a bad book, and one I’m sure I would have loved as a child, but not a favorite today. This entry was posted in Audiobooks, Children's / YA Lit, Classics, Fiction, Speculative Fiction. Bookmark the permalink. I loved this book as a child. My older sister discovered it first, and I have a vivid memory of sitting in the bathtub with her while she told me all about it. I was enthralled! This is probably my favorite of the Edward Eager magic stories I’ve read. But I can totally understand how it wouldn’t be quite the same when first coming to it as an adult. The very same thing happened to me with Enid Blyton’s Magic Faraway Tree, which makes me kind of sad since so many people loved it in their childhood. I enjoyed this well enough, but I’m pretty sure I would have adored this book as a child. Ah, but have you read The Time Garden? It is THE BEST ONE. At one point the children (a different set this time) go visit Little Women. And there’s a dragon. Everything about it is amazing. I love this one! And all of Edward Eager! But can see that maybe it wouldn’t appeal quite as much as an adult. Maybe. :) I tend to agree with Jenny that The Time Garden is the best one. I think the audio production really hurt the book’s chances. You know, for example, how Martha is kind of whiny? It’s one think to read about a whiny kid, but to *hear* the whining? Also, as an adult, I couldn’t quite wrap my brain around the developments in the adults’ lives. That wasn’t enough to make me dislike the book, but I couldn’t quite get behind it, you know? I read this one back when I started teaching. I think I read it to a class of 6th graders. It did have fans among my students but it was not a big favorite. I think I liked it better than they did and I also think it’s better suited for 4tha nd 5th graders. I do remember having some problems with the racism in the book. It’s not so bad for it’s time, but some of the stuff in it was pretty bad by today’s standards. I recall making some editorial decisions as I read it to my students. My class included several from Arabic backgrounds. Yeah, I can see how that one chapter wouldn’t go over so well these days. As you say, it wasn’t sooo bad for its time, especially since the character turned out to be a nice guy in the end, but definitely some unfortunate stereotyping (to put it mildly). I don’t believe there’s such a thing as taking a silly story too seriously- I believe everything is worth analysis. I remember this being cute, especially with the magic system, but otherwise fluffy. I just think we’re probably supposed to think about the adult relationships from a kid’s perspective, which would seem less problematic, but as an adult, I can’t quite do that. And actually even from a kid’s perspective, I’m uncomfortable with the message that kids from single-parent homes might get regarding their parents’ dating lives (i.e., must and will lead *swiftly* to marriage). This one is my favorite Eager, but I did read it as a child. The audiobook version is particularly distracting with the voice of the youngest child… and the cat! I was charmed by the cat passages when I first read this book, but the audio version just sounds like the reader has a mouthful of cat hair or something. I am so glad to hear from someone who listened to the audio–and who found it as grating as I did. The cat passages didn’t bother me too much, but I wondered how they were done in print. The youngest child, though—Nails on a chalkboard! I just re-read this one- hadn’t seen it since I was probably eight or ten years old- and went through it in one sitting. Very enjoyable. By “certain situations develop much more quickly than they probably ever would—or ever should—in real life” did you mean the marriage situation? That did seem rather hasty to me, when you realize the entire story takes place in a weeks’ time!